Hart Lee Dykes had some very nice cards during his heyday. Outside of his GameDay and his ProSet entries, there was his Score 1990 and his Action Packed 1990/91 that had solid action shots. Color me unimpressed by the warmup picture of him in his Upper Deck debut. (It is notable because it comes from a company that boasts about its quality action photography and poster cards.) The Collegiate Collection card is an OK photo but a terribly bland design. 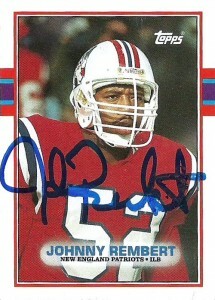 Why did I send those cards and not the Score 1990 or the Action Packed 1990? – I didn’t. He replaced my cards with these other ones. 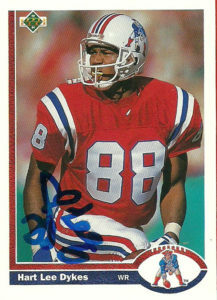 In a rare move I traded the Upper Deck 1991 to D-Rock on Sportscollectors.net- ironically for another Patriot, Eugene Chung (Action Packed Rookies 1992) for a set need. 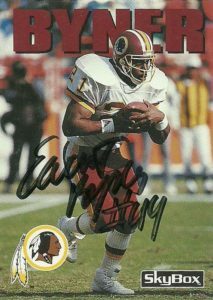 I then applied a remover to take the dedication to ‘Earl’ from the GameDay 1992 card. I don’t use removers, ever, but I made a special exemption here. 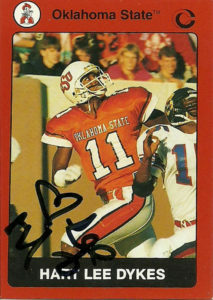 I genuinely wanted that autographed card and to flip through the collection and see the name Earl in it would just drive me nuts. 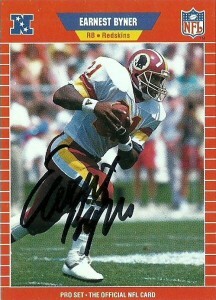 Again I do not like the idea of removing autographs/ dedications from cards. Typically that is a technique that is reserved for resale purposes, something I am strictly against. I kept the sad looking Collegiate Connection card and the Pro Set 1989. 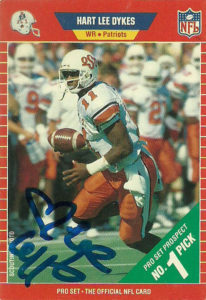 Hart Lee certainly had a very unique autograph. 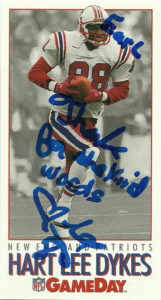 I mean I think he’s one of a handful of players who could get away with using a heart as the main part of his autograph. Despite having a bevy of teams get caught with their hands in the cookie jar bidding for Dykes’ services, Hart Lee went on to have a prolific college career and still holds many of the Big 8 records today. Acquired: 2012, Canton Acquisition. 2016, Future Considerations. After his stint as a coach for the Jacksonville Jaguars runningback coach from 2010 to 2011 Earnest Byner was signed to the Tampa Bay Buccaneer staff in 2012 serving under Greg Schiano. Unfortunately Shiano’s style didn’t mesh in the pros, and he was gone after two seasons. 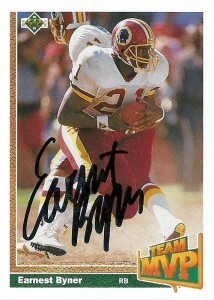 Byner was not retained as ownership decided to clean house after 2013. Since that time Earnest has addressed ‘The Fumble’ in public, apologizing to fans for what happened, and giving a tear-jerking recollection of it during the 30 for 30 ESPN documentary “Believeland”. Time heals all wounds though and the vast majority of Browns fans really embrace Byner as one of their own without judgement. 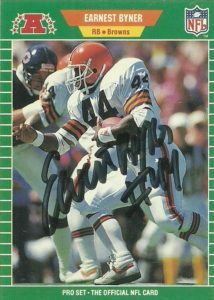 It goes without saying that it’s great that Byner has been able to move on from what happened- something that he said stuck with him and changed his playing style for the remainder of his career in the NFL. Earnest has done a lot of motivational speaking too. He also has no problem engaging his fans in public and is very popular in Cleveland. My friend DeadHorse scored these Byner autographs for me along with Kevin Mack and Greg Pruitt at an Ohio based Cleveland Browns event they attended. 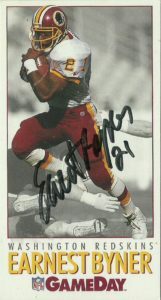 DeadHorse was kind enough to accommodate me on the 3 cards which I felt were his best action shots of Byner (Skybox 1992, ProSet 1989 CLE, and GameDay 1992).